Parvaneh Soltani shifts her car into third gear near notorious Evin Prison and descends from the dusty foothills of the Alborz Mountains into smog-filled Tehran. As she accelerates, the wind teases her polyester hijab, but it stays in place on a recent 90-degree afternoon. She gracefully weaves around people, cars, motorcycles and gender-segregated city buses as if she were navigating a magic carpet rather than a more workaday marvel: a Kia Pride done up in bright, Islamic green and conspicuously marked "Women's Taxi." In this frenetic capital city of 12 million people, women drivers are hardly a rarity; "this is not Saudi Arabia," many defensively point out. But a raft of other restrictions do exist in Iran: Women are not allowed to dance or sing a solo in front of men; and they can't travel abroad without a husband's permission, or file for divorce. But many Iranian women prefer to ride in the women-only taxis, and the resulting demand has enabled Tehran's women taxi drivers to achieve financial emancipation from men. Soltani is one of 700 drivers employed by Women's Wireless Taxi, a private company launched in November 2006. The company's dispatch center receives an average of 2,500 customer orders per day. Each driver is trained for nearly six weeks before she can turn on her meter, type an address into the GPS and start transporting other hijab-clad women. The drivers turn a share of their profits over to the company, but can set their own working schedules as they see fit. Soltani, 35, has cobbled together a routine that is part courier service for the municipality and part taxi service for the 125 "regulars" who call her directly. She manages to take home more than $12,000 a year  almost twice Iran's average annual household income. For Soltani, a divorced mother of two, driving a cab affords her the luxury of not wanting  or needing  to re-marry. She can even pursue her hobby of auto-racing, which has become, thanks to the campaigning of race driver Laleh Seddigh, the first sport since the 1979 revolution in which women can compete directly with men. Says Soltani: "My income is enough for me to lead my life." Few Iranian women can say the same, but their numbers are growing. Iran's unemployment rate among women is 15.4%, and double that for women under 25. Nevertheless, says Roksana Bahramitash, author of the forthcoming book Veiled Employment, self-employment among women is on the rise, in part because they're learning to exploit the gender divide. "Women have been able to turn gender segregation on its head," she says. "They are entering into the labor market, they are educated and they want to have an independent lifestyle." For 30-year-old Zahra Farjami, driving a taxi recast the balance of her household. She earns almost $10,000 a year, considerably more than her husband, she says. "I cannot say I was very happy [to become the main earner]," she says, but it has fostered a quiet sense of satisfaction. "Men always think that women can't be better than them; I didn't used to think they could either. But once I got this job, I realized that women can earn more than men." 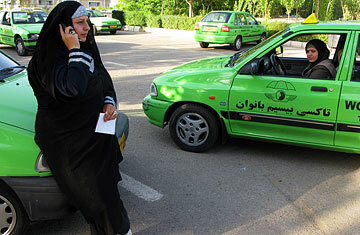 Women's employment in Tehran, Bahramitash says, is picking up , and many women are finding a niche in such male-dominated occupationsas driving taxis. "We didn't intend to physically separate the woman, but we wanted to provide this option of a taxi with a female driver," says Mohsen Orouji, male founder of Women's Wireless Taxi. "Women first thought that this was a masculine job and not a feminine job. It's a stereotypical way of thought that is put in place by society." At first, Soltani says the scheme's biggest critics were the city's male taxi drivers. "They treated us like second wives," she says, referring to the legal yet largely outdated practice of polygamy. "At the beginning they made fun of us. They were competitive. Now they are supportive because we work hard." Indeed, Ahmad Hasani, who has worked as a private taxi driver in Tehran for the past 20 years, says he doesn't feel threatened by the women's service. "It's been good for ladies; it's safe," he says. "Compared to men, the women are weaker taxi drivers  slower. But they care about traffic rules." Hasani then cuts off a car and makes it through the changing traffic light with a roguish grin. A bold move, surely. But Soltani would have pulled off with more grace, and without the bat of a mascarad eyelash.